We want your transition to the College of Pharmacy to be as seamless as possible, so whether you are interested in learning more about the entire university campus or you have specific questions related to pharmacy, we are happy to help. We encourage all new students to begin with a campus tour through the USC Visitor Center. 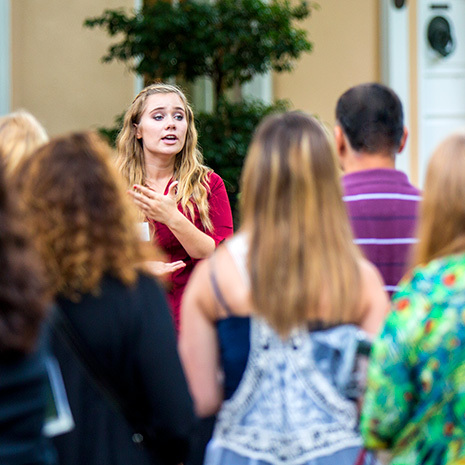 Walking tours are led by current students Monday through Friday and take about two hours. When you contact the USC Visitor Center, let them know that you are interested in the College of Pharmacy and you would like to request some time with us in addition to your campus tour. The Visitor Center will work with our team to schedule a tour of our facilities, based on your availability. When you arrive at Coker Life Sciences building, a College of Pharmacy pre-pharmacy adviser will serve as your tour guide and will answer any questions that you might have. If you are a graduate students or a prospective pharmacy student who is already familiar with the campus and would prefer to speak to a pre-pharmacy adviser about a College of Pharmacy tour, please call 803-777-4151 or email explorecop@cop.sc.edu.